People also call West Asia the Near East or the Middle East. It is the part of Asia that is closest to the Mediterranean Sea. West Asia covers all the land between Russia in the north, Afghanistan in the east, the Persian Gulf in the south, and the Mediterranean Sea in the west. 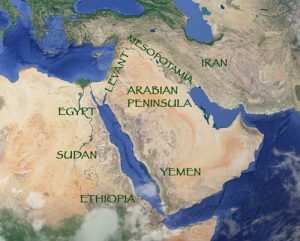 The Levant is the land right along the Mediterranean Sea. Today, that’s Israel, Lebanon, Syria, and Jordan. Mesopotamia, the land between the rivers, is modern Iraq. It runs north-west from the Persian Gulf. West Asia was one of the first places where people farmed and lived in towns. It was also one of the first places that had kings and built cities. Archaeologists disagree about whether the Egyptians or the Sumerians (the first people to build a civilization in West Asia) built cities first, but it was about the same time. Then other people, in Ecuador and Peru, in Iran and Pakistan, and in China, started to build cities just a little later. After the Sumerians, many other groups of people came to power in West Asia. Some of them, like the Assyrians or the Persians, stayed in power for hundreds of years. Others, like the Akkadians, held their empires together only for a short time. Sometimes these groups ruled all of West Asia, like the Assyrians, the Greeks, the Parthians, or the Arabs. Other times West Asia broke up into many small kingdoms: Israel, Phoenicia, Jordan, Babylon, Troy. The history of West Asia is pretty complicated, but mostly it is the story of some people trying to stay independent while other people try to get power over them. The Persian Empire, by Karen Zeinert (1996). There are some errors, but basically a good introduction. Cite this page: Carr, K.E. West Asian history – The Levant, Mesopotamia, and Iran. Quatr.us Study Guides, September 14, 2017. Web. April 21, 2019.